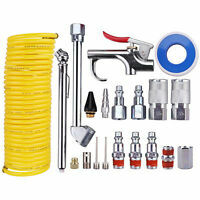 Stanley Bostitch PRO-14REPAIR Air Hose Repair Kit, 1/4"
Air Consumption at 90 PSI (SCFM): 2.6 Tank Capacity: 6 gal. Very happy with purchase. 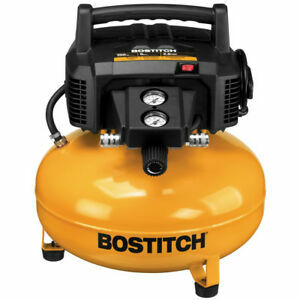 I did my whole roof (40SQ) on this compressor! i like it. Great for home. Good ebayer!! Works well. Easy purchase. Good value. works great. Runs my finish nailer perfect. loud but so is my old compressor. So far it is perfict. Excellent unit. Bought for portability but powerful enough to us with a full-size nail gun. Love the two hose connections. 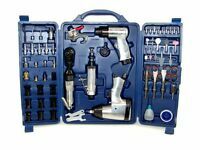 I needed a reliable and easy to handle compressor for installing molding in my basement as well as being able to use it for other purposes. I love everything about this compressor - it's light, works like a charm and as a refurbished item, it is indistinguishable from new. I'm so pleased to have made this purchase.